Despite years of effort and the implementation of a myriad of development strategies, no country in Latin America is developed or even close to it, a stark reminder that the job is hard and largely pending. However, Costa Rica presents an example of important progress, particularly through the internationalization of its economy after economic reform beginning in the mid-1980s. Over the last three decades, Costa Rica has fairly consistently implemented significant reform in its trade and foreign investment policies, among other related policy areas. This yielded some valuable results in terms of the volume and composition of its exports, the sectorial composition of its economy, and the volume and nature of the foreign direct investment (FDI) it attracts. As a result of these policies, it ranks second in Latin America in terms of cumulative output growth (PPP) in the three decades after 1980, and first in the proportional fall of its extreme poverty rates. Costa Rican progress can be largely attributed to this trade and investment performance. Editor Feinberg, R.E., Piccone, T.
Trejos, A. (2014, January). 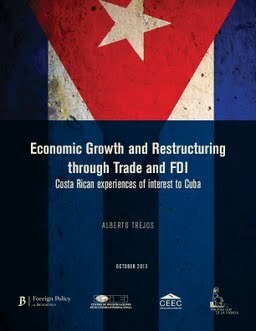 Economic Growth and Restructuring through Trade and FDI: Costa Rican experiences of interest to Cuba. (Feinberg, R.E. & Piccone, T., Eds. )Cuba’s Economic Change in Comparative Perspective. Brookings Institution Press.